Cape Town to Bloemfontein flight bookings qualify to participate in the exclusive SouthAfrica.TO travel voucher for travel review system. Simply email a writeup to cheapflights@southafrica.to and we'll send you vouchers. Your choices are to either drive 1000km or to book a cheap flight to Bloemfontein from Cape Town. Use the flight price comparison tool on the left to contrast airfares of Mango Airlines & SA Express (the only airlines flying from Cape Town to Bloemfontein Bram Fischer International Airport, BFN). Mango is usually cheaper than SA Express, but not always. CPT-BFN is the only surviving flight to Bloemfontein which Mango Airlines flies (they used to fly JNB-BFN and DUR-BFN). Don't be shy - Ask a Travel Consultant : We are itching to show you the best flight deal from Cape Town to Bloemfontein. March, April & May 2013: Free Wi-Fi is offered on Mango flights to Bloemfontein from Cape Town. As the crow flies, it is some 909km from Cape Town International Airport to Bloemfontein Airport. The driving distance from Europcar at Cape Town International Airport to Europcar at Bloemfontein Airport is some 1013km, and takes about 12 hours. Along the way you pass Paarl, Worcester, De Doorns, Touws River, Laingsburg, Beaufort West (and the Karoo National Park), Hanover, Colesberg, Trompsburg and Edenburg. Leana & Ernest embarked on their own cycle tour from Cape Town to Bloemfontein. Their route was from Cape Town to Kleinmond, Hermanus, Gansbaai, Bredasdorp, Swellendam, Heidelberg, Stilbaai, Mossel Bay, Wilderness, Knysna, Keurboomstrand, Storms River Village, Jeffreys Bay, Colchester, Peterson, Middleton, Cradock, Hofmeyr, Steynsburg, Burgersdorp, Aliwal North, Zastron, Mohale's Hoek, Wepener, Dewetsdorp and Bloemfontein. They encountered ferocious headwinds, tailwinds, sore backsides, the friendliness of Heidelberg (a stranger offered them accommodation at her holiday home in Struisbaai), a petrol attendant who thought the pipes they were sucking on was their oxygen, rain, thunder, lightning, an idyllic campsite in Zastron and the vibiness of Lesotho. It's interesting to look at the history of prices (of course they will have changed from the below by now). As you can see Mango Airlines is usually cheaper (although SA Express offer more legroom), but not always. Of course these prices listed below are not available anymore, they are merely for historical reference and interest. 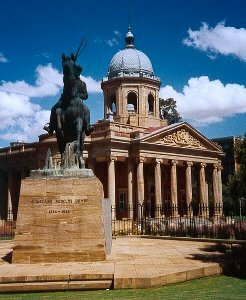 See full list of hotels in Bloemfontein. We recommend The Urban Hotel or the City Lodge. The Protea Hotel, Dersley Manor and B&B At Bloem are popular amongst guests.